Youth farmers and staff harvest carrots in Frogtown on Monday morning. Every Monday, a small, dedicated group of youth farmers and staff meet in Frogtown to care for the three farms in the neighborhood. The group keeps the farms weeded and watered, and ready to go for programming each week. 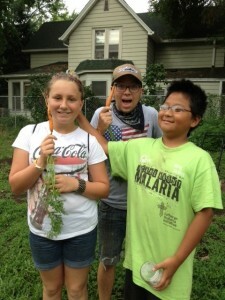 Today, youth farmers harvested one of their favorite veggies: carrots! Sam Bedker liked this on Facebook. Previous PostPrevious Chillin’ in the shade eating oranges… SOCC! HAWTHORNE!